Is the MateBook 14 just another Huawei laptop, or is it something special? 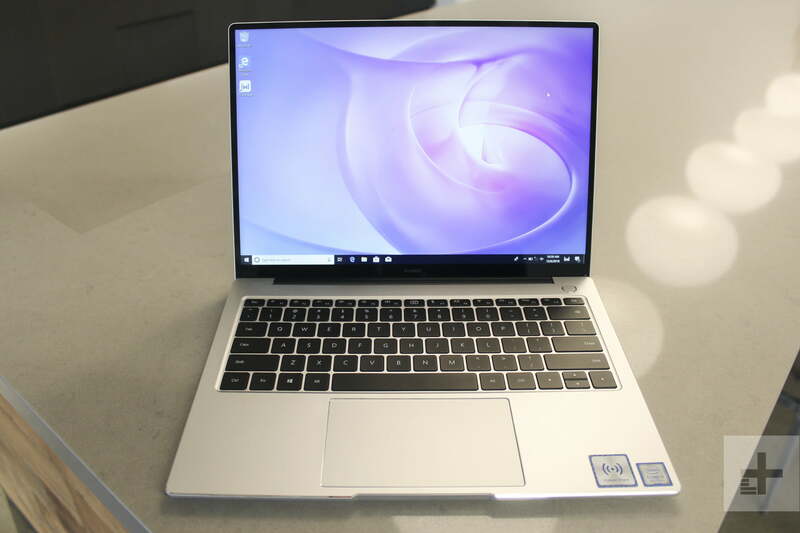 The Huawei MateBook 14 is an interesting alternative to its sibling, the MateBook 13. When you think of Huawei you might think of phones, but the company also has some interesting Windows machines. Huawei is now announcing a new MateBook 14 laptop. It sits in between the MateBook X and MateBook D series, promising premium design at affordable devices. 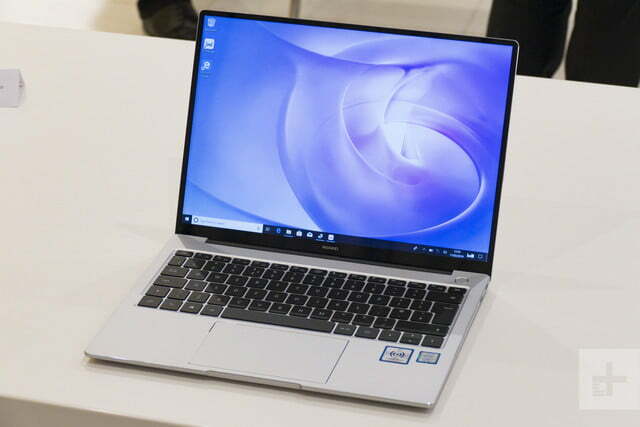 But Huawei already launched the MateBook 13 earlier this year, so what does the new MateBook 14 have over its smaller sibling? We spent some hands-on time with it ahead of Mobile World Congress, hoping to find a solid alternative to Huawei’s other laptop offerings. It’s hard to escape comparisons to the MacBook for many laptops, but it’s especially true with Huawei’s MateBooks. Just like the MateBook 13 and the MateBook X Pro, it features a sleek aluminum chassis with a minimalist design. That might make it look identical to its siblings, but there are some differences. While the MateBook 13 was all about portability with its 2.82 pound weight, the new MateBook 14 is a bit different. It’s not that slim, and we could feel its hefty 3.3 pound weight when we held it in our hand. That makes it bulkier than the MateBook X Pro’s 2.9 pounds. 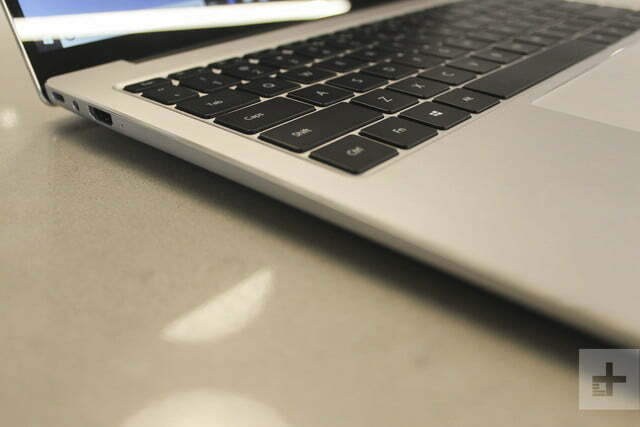 With a thickness of roughly 0.62 inches, the sides of the laptop are also just slightly bigger than the MateBook 13. 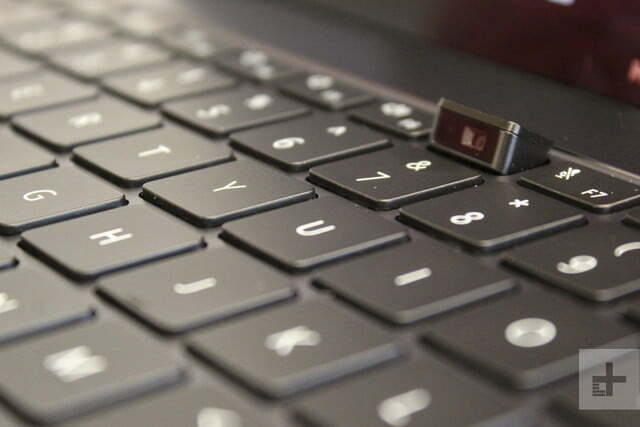 It comes in at the same size as the 0.59-inch-thick MacBook Pro or the 0.62 inch thick ThinkPad X1 Carbon. That’s still not a bad thing, as it does make it look nice when sitting on a table. The MateBook 14’s touchpad is frustrating and doesn’t exactly feel premium. Another great element on the MateBook 14 is its keyboard. 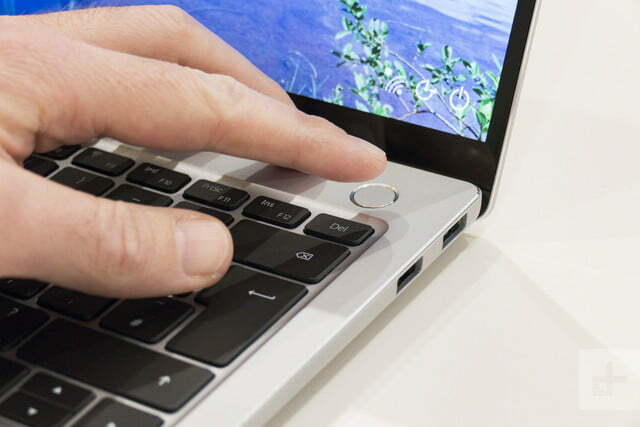 Rather than an edge-to-edge design like the MateBook 13, its keys are instead in a traditional island-style layout. When we opened Notepad to type up a storm, it proved very comfortable. Yes, the keycaps might be more elevated than the MateBook 13, but it provides extra spring and lift when jamming out sentences quickly. You’ll also find the built-in fingerprint reader in the power button directly above the keyboard. Also different is the webcam. Instead of being in the top bezel, it lives in the keyboard between the F6 and F7 keys on the top row, just like on the MateBook X Pro. It only pops up when you press on it. That’s an innovative but slightly awkward experience. When we opened it up and started typing, our knuckles were caught in the camera angle. Even worse, the 1-megapixel quality doesn’t look as high as the HD webcams on competing laptops like the XPS 13. The MateBook 13’s simpler solution is a bit more convenient. The touchpad is also frustrating. Just like the one found on the MateBook 13, it doesn’t feel premium. While it is large and there is plenty of dragging surface, clicks produce a hollow and uncomfortable feedback. It does match the look of the chassis, we’d prefer Huawei choose a glass surface rather than plastic as they did on the MateBook X Pro. 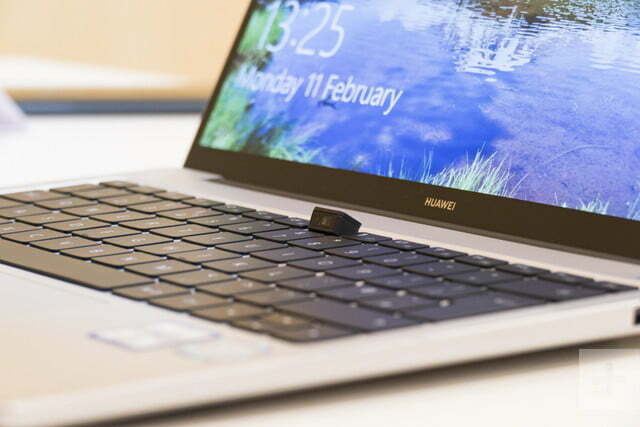 The MateBook 13 came with two USB-C ports, but Huawei shakes things up with the MateBook 14. Onboard the newest member to the MateBook family are USB-C, HDMI, USB-A 2.0, and USB-A 3.0 ports. Best seen with the XPS 13 or MacBook Air, it has become more of a rarity to see both USB-A and HDMI in laptops. No dongles necessary! Huawei also manages to pack in the same big battery found on board the bigger MateBook X Pro. Rated at 57.4 watts-per-hour, Huawei claims you can get up to 15 hours of battery life. That’s an upgrade from the 41-watt-hour battery on the MateBook 13. Of course, more testing is needed, but that seems promising considering the positive results we saw with last year’s MateBook X Pro. The MateBook 13 just barely edged out at 5 hours in a video loop when we reviewed it. In our hands-on time with the MateBook 14, a 100 percent charge held up for about 15 minutes, so the power is likely there to last. The new MateBook 14 follows with its other siblings and comes in with a 2,160 x 1,440 (185 PPI) 2K resolution 3:2 aspect ratio display. That is less than the 3,000 x 2,000 (260 PPI) 3K resolution on the MateBook X Pro, but it is still a departure from the traditional 16:9 aspect ratio on most Windows laptops. Numbers aside, it all means that whatever is on your display will extend all the way down to the bottom bezel. Opening Microsoft Edge, we stacked windows side by side and scrolled through webpages with ease on the MateBook 14. Browsing the web and going through basic productivity tasks never looked more fantastic. Huawei even packs a 90 percent screen to body ratio into the MateBook 14. That’s higher than the 88 percent ratio on the MateBook 13. Bezels are thin, and almost to the same levels of the Dell XPS 13, but still not as much as newer laptops the Asus ZenBook S13. As another plus, the display also supports touch. A neat little gesture lets you swipe down from the top to capture whatever is happening on your screen. It might be a bit niche, since built in tools in Windows can already help you do this, but the movements are intuitive. 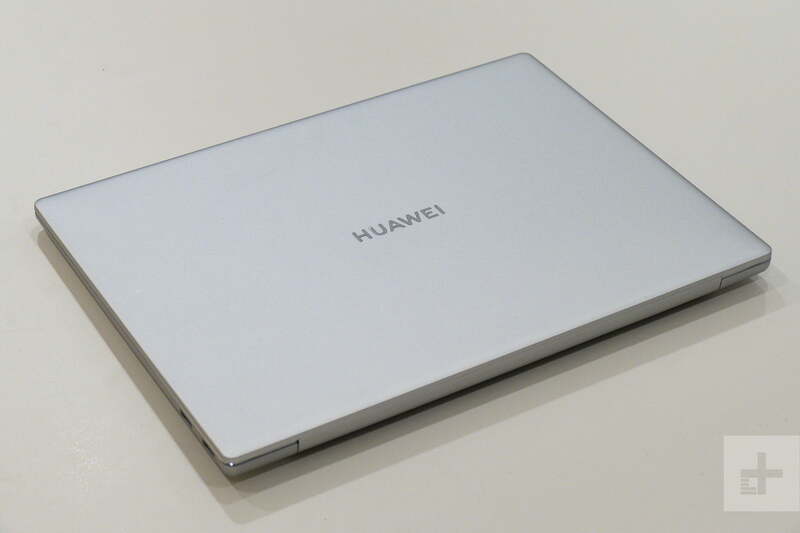 That pairs up with the laptops support for Huawei Share 3.0, which is also found on the MateBook X Pro and comes with screenshot, clipboard, and photo sharing synergies between Huawei’s Android phones and the laptop via NFC. It’s likely the MateBook 14 could handle light gaming, but will probably struggle to play big titles like Fortnite. As another niche feature, Huawei is bundling in an eye comfort mode to the MateBook 14. The software apparently reduces harmful blue light with built-in software, but we couldn’t test it out in our hands-on time. Again, it isn’t exactly a defining element as Windows 10 already has a built-in Night Light ability. Along with coming the latest Intel Whiskey Lake processors, the MateBook 14 has an option for the Nvidia MX250 GPU with 2GB of VRAM. We couldn’t try it out in a game on our hands-on unit, but this is an upgrade from the MX150 found on board the MateBook 13. It’s also the same GPU found onboard the new MateBook X Pro. More testing is needed, but rumors indicate that the GPU could be about 10 percent faster over last generation. If that holds up to be true, then it won’t be much of an upgrade. In testing on the MateBook 13, the MX150 already could handle light gaming, but struggled when playing big titles like Fortnite at higher settings. Huawei is targeting a May launch in the US for the MateBook 14. Pricing was not shared immediately, but we do know that multiple configurations will be available, including a Space Gray and Mystic Silver colorway. The MateBook 13 is currently priced at $1,000, and the MateBook X Pro at $1,200, so the final cost of the MateBook 14 could fall in the same range. Options include a model with the Intel Core i5-8265U processor, or the Core i7-8565U processor. RAM can be configured to either 8GB or 16GB, and the PCIe SSD up to 256GB or 512GB. The base models will include the standard Intel UHD graphics 620 rather than the MX250 graphics card.